Kenya's government has ordered the closure of 13 money transfer firms to prevent militant Islamists from using them to finance attacks, the interior minister has told the BBC. The bank accounts of 85 individuals and "entities" had also been frozen, Joseph Nkaissery added. Those targeted include a Somali-linked bus company and hotel. An assault by the Somalia-headquartered al-Shabab group killed 148 people at Kenya's Garissa University last week. Kenyan officials have repeatedly accused Somalis in the country of colluding with the militants. Nearly 500,000 refugees are in the country - many of whom fled decades of conflict and drought in Somalia. Kenya also has its own Somali population - most of whom live in the capital, Nairobi, and in the north-east, where the university attack took place. Somalis say most of them are law-abiding citizens of Kenya, and they have also bore the brunt of al-Shabab's insurgency. They have condemned the government's crackdown as "blanket punishment" of the community. BBC Africa's Abdullahi Abdi in Nairobi says hotel and transport companies, as well as Muslim clerics and human rights organisations, risk having their bank accounts frozen. The 85 individuals and entities put on an officially published list had 24 hours to demonstrate why their bank accounts should not be frozen. 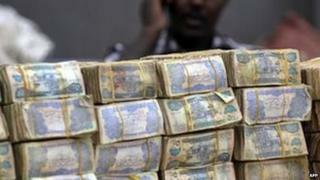 They include leading money transfer firm Dahabshill, which has repeatedly denied links with militant Islamists. The list is headed by Mohamed Kuno, a former Islamic school teacher in Garissa and the alleged mastermind of the university attack. Somalis around the world rely heavily on money transfer firms, known as "hawalas", to do business and to send cash to relatives because of the almost non-existent banking sector in Somalia. There have been a similar crackdown on the companies in the UK and US where the governments have adopted strict money-laundering laws making it difficult for banks to deal with them. A spokesman for the Somali money transfer agencies in Kenya, Abdi Ali, told the BBC they would oppose moves to shut them down. "To us, it is only a ministerial directive which is sent to the central bank. We will talk to the Kenyan government about this issue and use its justice system to settle matter," he said. The United Nations estimates Somalis in the diaspora send home about $1.6bn (£1.1bn) annually, significantly more than foreign aid. More than 40% of Somalis receive remittances, the bulk of which are used for basic needs, including food, clothes, medicine and education, according to a UN survey. Somalia has not had a functioning government since the fall of Siad Barre's government in 1991, and has been hit by religious and clan conflicts.